Happy upcoming Thanksgiving to you, Elmomonster ! My friend took me here few months ago, shortly after it re-located. We tried their dinner combo specials with Kabobs just to be safe. The beef kabob blew me away. But it was their coconut ice cream that begged us to return. By the way, you watch Food Network? Did you see the Iron Chef Thanksgiving Showdown? Elmomonster, love the Batman analogy. Gotta look up what Celebration, Florida is all about. I'm thinking my father in law took me here once, not sure, was it next to some bowling alley? I love a good bowl of tom kha gai! Hey Elmo - It's good to know that Renu Nakorn is alive and doing well. Looks a lot nicer than the last time I visited.... The renovations looks to have been done well. 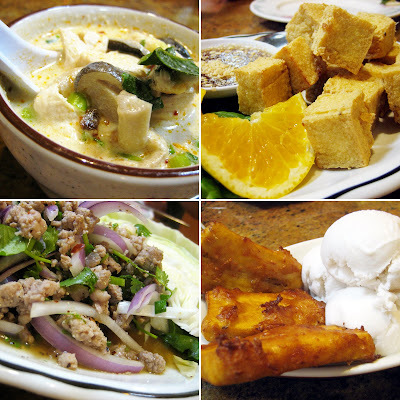 ...sigh..I have many fond memories of the tom kah kai and the awesome larb (with crispy rice) that I could get at the old Mission Viejo branch of Thai Nakorn, before they sold it & "Americanized" it & drove all the authentic flavors away. Well we can't all be Andrew Zimmerns! HAHA! And a Happy Turkey day to you and yours too! I need to try more stuff there. Next, it'll be the Issan specialties, though no one seems to game enough to chomp on wild boar. I didn't see the Iron Chef Thanksgiving, but I'll have to TiVo it now. I'm sure it'll get re-run more than once! Ah...Celebration, Florida. It's a city masterplanned by none other than The Disney Company. So it's extra wholesome and pretty. I only had it on my mind as I wrote it because it was mentioned in an episode of The Office a week or two ago. Also, I'm a not-so-closeted Disney fan. Oh yes! I think I prefer this Thai version over all others. Okonomiyaki's good and all, but I'm all about the crunch!!! They did a great job, perhaps too good. The element of danger is gone, but meh...so long as the food is good! I, too, heard stories about the Thai Nakorn that went astray. Thankfully, I heard about it before I tried to go. And when I heard it was Americanized, I just drove north instead of south, to the Thai Nakorn in Garden Grove (at the time). And all was well! I'll have to give the Thai version a try, then! Oh. I meant to say that Okomikyaki usually has pork. My brain is kind of fried right now. I think it's because of some possible news. I'll know for sure this weekend. I drive past this restaurant everyday going home. I picked up pad thai & some dumplings a few weeks ago, the dumplings were good. The pad thai didn't taste quite right, it was very bland. I had to add sugar, fish sauce, and some more vinegar. I would go back and try something else but avoid the pad thai. You should try My Thai in Whittier, they have good pad thai & spicy fried rice. Also, they soft shell crab on the menu... you don't see that too often in a Thai restaurant, pretty good stuff. Happy Thanksgiving Elmo! I hope the news is good. There's just too many cases of bad news out there right now. My Thai? Is that the one with the kickboxing demonstration set to karaoke? I'd heard about a Thai place at Whitwood Mall and was looking forward in going...especially if they had kickboxing and karaoke! Elmo my man, for the first time, I think we're related! LOL. 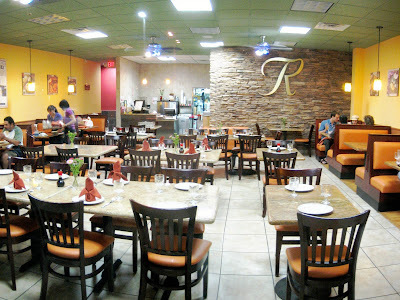 Renu Nakorn has always been my favorite Thai place. Even more so than the other so called Isan/E-san that people have been yapping about. You should have let me know you are coming up there because some of my other favorite dishes are in their "Northern Specialities" portion of the menu. Their slow cooked beef and Khoi Soi are to die for. I'm about to do a segment on their special section of the menu in my blog very shortly. I'm just glad you are able to get up here for some chow. By the way, you need to move up here. Since you'll be closer to Cafe Hiro and Magic Wok too! Well that's good! And somewhat of a relief. I'm all about the Cafe Hiro, the Magic Wok, and now Renu...but what I've been trying to do is get these places to move near ME! I even wrote up Magic Wok as the reason why OC should annex Artesia and Cerritos on OC Weekly's Best Of 2008! HAHA! So far, no bites. AH. I just checked with my friend. It was Thai Table that had a Muy Thai demo in the middle of dinner service. And I think it was on a special night. Wierd that there are two Thai places so close to the Whitwood Mall. Where were they when I used to live in the area?! But if I find myself up there, I think I'd go to My Thai because of the soft-shell crab that you spoke of. I'll go anywhere that serves soft-shell crab. Besides, I can always rent Ong Bak if I want to see Muy Thai. I lalalove Thai Food and this place is super close! I am excited. Hope you enjoy! It's definitely one of the better ones out there! A must try. No doubt. I empathize with the location issue though, you know it! Still have Siam Taste of Asia in my pocket. That's a lot closer and from what I hear (from you and Gustavo), it's THE IT place now. So many places...so little time!!! mm coconut ice cream and fried plantains sounds heavenly.. the looks kind of like the taiwanese oyster omelette- is it similar? Actually it is VERY similar! I was going to mention its similarity but I figured not a lot of people have had the Taiwanese version. The ingredients are almost exactly the same. The Thai seem to crisp it up more than the Taiwanese. They don't sell food at the Thai temple any more? That's a bummer! Is this place better than Thai Nakorn? Hmm...Is this better than Thai Nakorn? For me, that's a tough thing to say so far. This was my first trip and I only had those five items to judge. All were good to great. But that mussel dish was probably the best I've had yet. 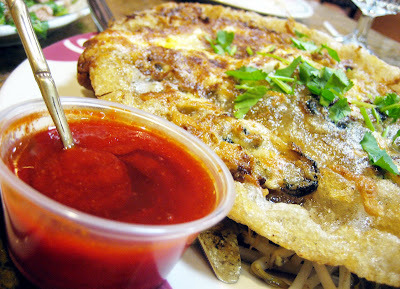 Thai Nakorn holds a special place in my heart...but this has potential too, if I were to form my opinion on what I had.